Happy Bloggers Challenge Friday! Thanks to those who played along with the Red, White and Blue Challenge! The challenge this week is Pennants or Fishtails (open to your interpretation). 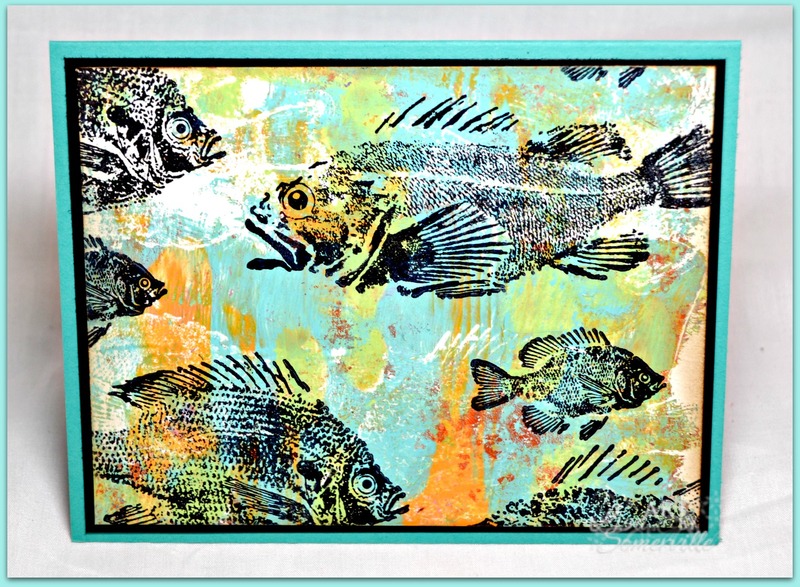 I was going to use Fishtail "dies" for a card project, but opted to go the Mixed Media route, using the Gelli Plate and Fish stamps from Fred B. Mullett. To create the background panel, I applied DecoArt Americana Multi-Surface Satin Acrylic Paint in Coastal Waters, Citron Green and Orange Sherbet to my Gelli Arts Plate, then added the Dottie and Jacks Stencils from Just a Trace, and randomly stamped the fish images from Fred B. Mullett directly onto my plate. Stamping directly onto the Gelli Plate left more of a "bleached" image when I pulled my print. (Sorry for the dark photo of the pulled print - but I wanted you to see the results of stamping onto the Gelli Arts Plate.) Be sure to clean your stamps immediately if you try this so you are not scrubbing paint from your stamps! Once the background panel was completely dry, I stamped the images again using Ranger Black Archival Ink. 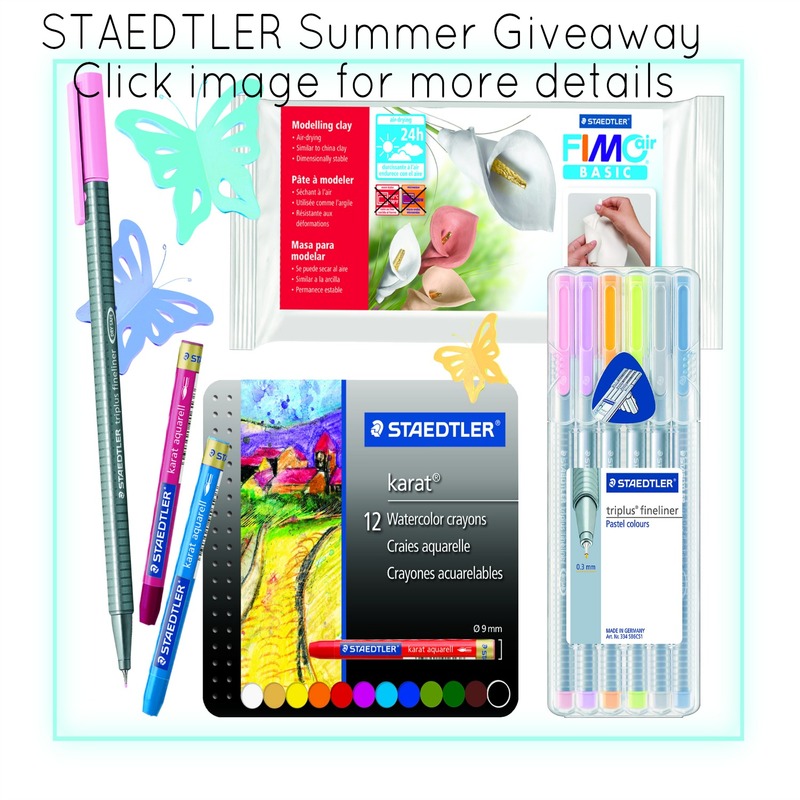 Don't forget to enter the STAEDTLER Summer Giveaway for your chance to win this fabulous STAEDTLER Prize package! More details can be found here. If you'd like to play along with this weeks Bloggers Challenge, please link back to this post on your blog and mention you created your card for the Bloggers Challenge Pennants or Fishtails Challenge. Please add your link using the Link Tool below, your link should be a direct link to your Bloggers Challenge Post, use your name as the Title. Please do not link to cards that were created prior to the challenge date. Entries not linking properly, or backlinked will be removed. If you have the captcha enabled on your blog, please consider turning it off, as it makes it so much easier to leave comments. Fish tails -- love it! Gorgeous card. So cool, Lisa! Love the bleached-like look of the images stamped directly on the plate.